The study was conducted under the Authority of the Department of Primary Industries, Parks, Water and Environment (DPIPWE) permit No. 10028. We thank Julian Harrington, Amelia Fowles, Luis Henriquez, and Jaime McAllister for helping with the collection of samples in the field. Help with laboratory analyses was provided by Cedric Simon, Bryan Choa, Baseer Codabaccus, Daniela Farias, and Mana Inoue. We would like to thank two anonymous reviewers for their valuable comments and suggestions to improve the manuscript. 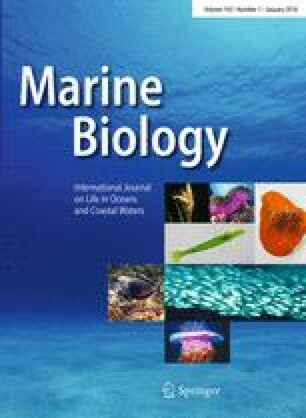 This study was supported by funding to JMS by the Australian Government’s Fisheries Research Development Corporation (Project No. 2008/022); JMS and TM by the Tasmanian Department of Primary Industries, Parks, Water and Environment, Fishwise Community Grant; and TM by an Endeavour International Postgraduate Research Scholarship (EIPRS). We also wish to thank Nick Jones and Lara Marcus for comments and valuable suggestions on early drafts of the manuscript.